"It was amazing saving a life, it felt beautiful." 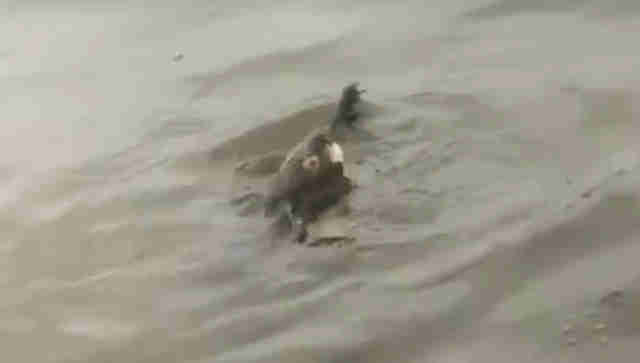 A koala who'd gotten himself in over his head while traversing a river in Australia was pulled to safety just in time - all thanks to the quick thinking of a man who refused to ignore his struggle. Muzammil Patel, a volunteer for Australia's Great Victorian Bike Ride, had just arrived to one of the event's campsite stops on Apollo Bay when a woman there alerted him to the animal in dire threat of drowning. Wildlife officials had been called to assist, but Patel knew that situation called for a more urgent response. So, he leapt into action, wading out into the water to pull the little guy to safety. The entire rescue was caught on film. While this heroic gesture only took a few moments, it may very well have changed the koala's fate forever for the better - and that's something those present won't soon forget. "It was amazing saving a life, it felt beautiful," Patel later told the Bicycle Network. "The lady who spotted him was crying after she saw that the koala had been saved."